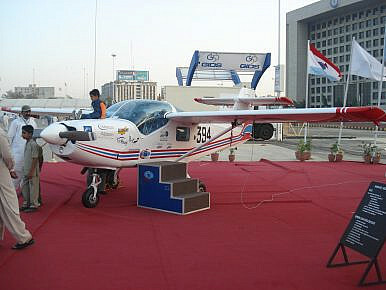 The Turkish Undersecretary for Defense Industries (SSM) has awarded Pakistan Aeronautical Complex (PAC) a contract for the sale of 52 MFI-395 Super Mushshak military training aircraft. According to media reports, the deal was concluded on May 10 at the sidelines of this year’s International Defense Industry Fair, which is taking place in Istanbul. The defense deal constitutes PAC’s largest export order to date. Neither SSM nor PAC revealed the value of the contract. PAC won a competitive bidding process in July 2016, following the Turkish Air Force’s announcement that it will replace its aging fleet of Italian-made Leonardo light trainers with up to 52 new military training aircraft. The MFI-395 Super Mushshak is a PAC licence-built variant of the Saab MFI-17 Supporter aircraft, which Pakistan acquired from Sweden in the 1980s. In comparison to its Swedish predecessor, the upgraded MFI-395 variant features a new engine and a new flight control system, among other things. Fitted with six hardpoints under the wing pylons, the aircraft can be armed with rockets and missiles. The MFI-395 entered service in 2001. The Pakistan Air Force (PAF) is currently operating around 300 Super Mushaks at various training facilities. Other customers of the MFI-395 include Iran, Iraq, Oman, and Saudi Arabia. At the fair, Pakistan and Turkey also signed a letter of intent for the sale of four Turkish-made MILGEM corvettes to the Pakistan Navy, next to a collaboration agreement between PAC and Turkish Aerospace Industries (TAI). While PAC has scored a major export order with the MFI-395 Super Mushak, its flagship product the JF-17 Thunder combat aircraft, designed and built in cooperation with the Chengdu Aerospace Corporation (CAC) has proven a much tougher sell. Pitched as a low cost fighter for air forces in the developing world, a number of countries have purportedly expressed interest in the JF-17 fighter jet including Argentina, Bangladesh, Bulgaria, Nigeria, the Philippines, Venezuela, and Zimbabwe. However, PAC has so far failed to score a major export order, although Pakistan announced in 2015 that it has a first international customer for the JF-17. Nevertheless, up till now PAC has refused to reveal any details pertaining to the alleged deal. PAC and CAC have so far delivered around 70 JF-17s with 14 additional aircraft expected to be produced by the end of the 2017. Next to boosting Pakistan’s military exports, the JF-17 was originally developed to replace the Pakistan Air Force’s aging fleet of Dassault Mirage III/5 fighter jets by 2o20. Pakistan to Arm Super Mushshak Aircraft for Counterinsurgency OperationsPakistan Moves Ahead With Sale of 3 JF-17 Fighter Jets to NigeriaPakistan Stands Up New Fighter SquadronIndia-Pakistan Crisis Exposes Modi’s DilemmaHas Pakistan’s JF-17 ‘Thunder’ Block II Fighter Jet Engaged in its First Dogfight?